I've come to the end of the sixth year of The Next Generation. One to go. With season five I managed a few episode pieces but time and Star Trek news have been against me which meant only Schisms and Chain of Command were given a run out in blog form. With my attention turning to the 1993/94 season very soon, I'll be using that time to reflect back on some of the things and themes that made the series tick for me over the course of 178 episodes. While the fifth year turned experimental and delved into some quite personal issues as well as coping off-screen with the death of Star Trek creator Gene Roddenberry, I was never the greatest of fans. At the beginning of the sixth season the first two episodes originally left me incredibly cold and worried as to where the year was going to be heading. Time's Arrow had provided a thrilling conclusion but the season opener was a massive comedown from all the set up of the previous year. Indeed, there had been a lot of escalation and only 45 minutes to conclude the story which could maybe have done with a third part to ensure that it didn't come across as rushed as it did. While on the re-watch it's not a bad episode it's not the way you would hope to start a season. It's very convenient and when Data turns up as if by magic I still find myself cringing. While a return to Realm of Fear made me realise it's not as hokey as I first thought, it's not until Relics that we see any sign that this season has promise. I would go as far to say that not since season two had I experienced such a mediocre start to a year of The Next Generation. Relics is undoubtedly one of the classics of The Next Generation's entire run and a personal favourite. It is still the only episode of Star Trek I have ever watched more than once in the same day. Schisms isn't a high profile episode yet it does manage to reaffirm the average nature of the early season with True Q, Rascals and The Quality of Life close by doesn't help. Now I'm not saying they're rubbish, just less than you would expect from a show that's heading into its sixth series. While the stories themselves at this stage might not have been making waves there was a lot more going on within them. Character development seems to take a Moon-sized leap. 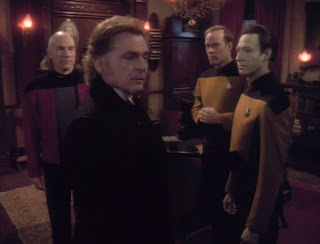 Secondary characters such as Dwight Schultz's stammering Barclay get flesh to their transporter-phobic bones and while Man of the People is easily contender for worst episode of the season it gives Troi a decent level of screen time not being overshadowed by her mother and giving the Betazoid something more to do than sit at Picard's left hand or worry about some kid's feelings. A Fistful of Data's also allows Sirtis to spread her wings a bit and when not restricted to the role of counsellor she really gets to shine - i might as well add Face of the Enemy in here too since its all about Troi and adds weight to that exact point. This experience comes in more than useful by season's end and the visit to the time frozen Warbird in Timescape. She's an expert, don't you know. When Marina gets some space she's more than capable of running with it. 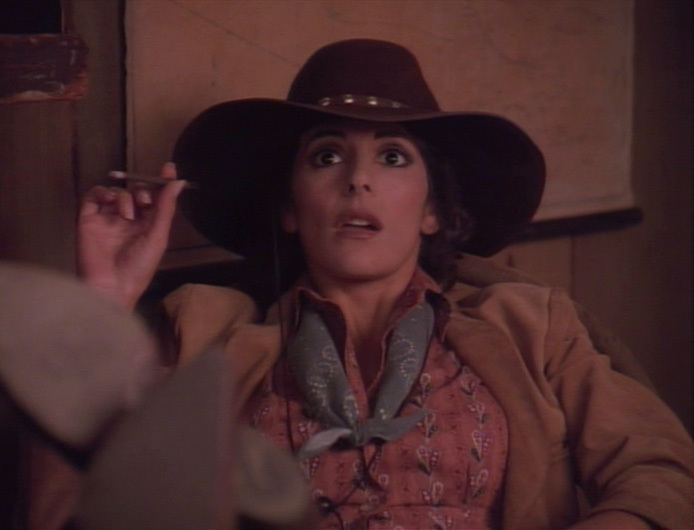 The more you think about it, doesn't it become apparent that this is Troi's best year? Character development and finally her own Starfleet uniform courtesy of Captain Jellico in Chain of Command can't be such a bad thing - add to that it's a Lwaxana-free year and things are definitely on the up. I've talked about Chain of Command previously in Some Kind of Star Trek so I won't go over it again suffice to say it's one of the stronger two-parters in The Next Generation most likely helped by being mid-season rather than having its conclusion unwritten before the return from holiday. This re-watch even made me review my grumbles with the later Birthright duo which we'll come to in due time however I seem to be getting well ahead of myself here! While the previous year had been about hitting some big moral issues, the writing staff appear to refocus here and look at the existing crew in more depth than ever before. The above shows how much breathing room Troi was appreciated and Worf, likewise gets to be our guide into the Klingon culture both in the Birthright two part story and the later Rightful Heir. What this second one shows is that continuity was being honoured and events were not being seen as one offs as soon as the Enterprise left orbit. Ship in a Bottle also carried this theme with the return of Moriarty from season two's Elementary, Dear Data. It also had an absolutely brilliant twist that even when I see it now still gives me a smile. This second appearance from Holmes' nemesis and Daniel Davis is definitely well overdue (and allegedly because of legalities with the Conan Doyle estate). The distinctly dodgy Aquiel doesn't quell too many fears (but still not going to beat Man of the People) that this isn't holding up as a season; don't tell, but the dog did it. It's not until the Troi-centred Face of the Enemy that we really see the year finally finding its feet. A good story, Sirtis at her best chewing out a Romulan commander and genuinely being in danger for once. What this makes you realise is perhaps how gimmicky those early shows are in the '92-'93 season - just think back to how many of them seem like "neat" ideas - transporter has creatures in it, crew turned into kids, holodeck malfunction - or reliant on past characters (Scotty, Q, Barclay, Moriarty). Was there a genuine concern that they had nothing new on the boards? 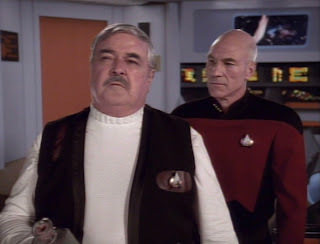 Continuity is a big factor - Face of the Enemy references Ambassador Spock's underground movement and Tapestry finishes off the story first mentioned back in season two's Samaritan Snare which led to Picard to gain his artificial heart. 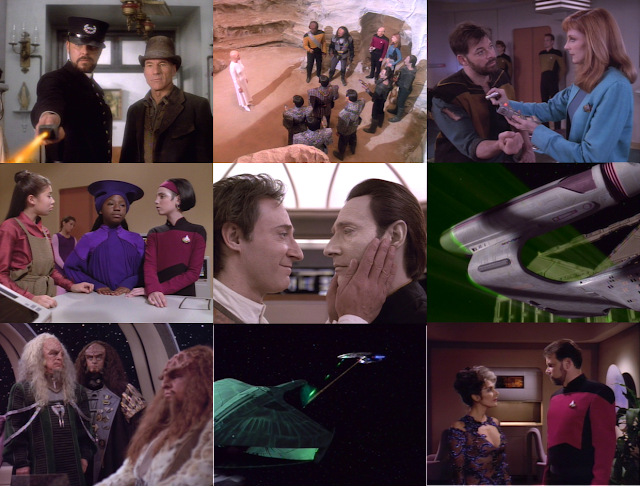 Later episodes would open up old romances (Troi and Riker in Second Chances) and the return of both the Borg and Data's brother, Lore at the end of the year. Rightful Heir even manages to link back to Birthright and that's only a few stories distant. 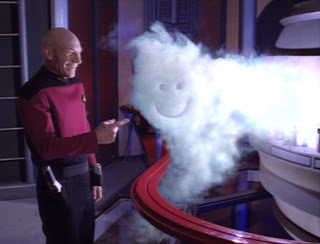 This unexpected second visit to the Enterprise by Q is probably his best outing since Q Who? . With the withdrawal from such heavy handed themes and stories that we experienced at this point in the previous year it does seem that the cast are enjoying themselves a lot more with their characters. We learn a lot about Picard here as well as in Chain of Command although it's a more somber affair there with four lights. That brings us to the Birthright tale which, even though it's better than I remember still gives me one niggle - it's a two part story yet Data's dream programme is only worth building on in the first 44 minutes?! I remember hoping that the conclusion would expand on the speech his vision of Soong gives and we got nothing....and we had to wait until Phantasms (personal favourite) in the following season to get any kind of next step in the story. That would be the second and last time we'd get to experience the wonders of Data's sleeping state for ourselves. This was a great departure for the character and I'm surprised that it wasn't expanded on further. The remainder (more accurately the majority) of the two-parter is Worf 100% and importantly one of the biggest episodes to talk about the background of the Klingon people while also fleshing out some of the security chief's background. In fact it's another instance of series continuity as we're reminded of the Khitomer Massacre - the first reference since Redemption I think. In the 90's it wasn't something that captured my attention but now I can see the value of the story and how it strengthens the character of Worf. Talking of character strengths - if Tapestry wasn't a step in the action direction for Picard then Starship Mine certainly was. As well as being Tim (Tuvok) Russ' first Star Trek appearance it's The Next Generation's blatant take on Die Hard. As an adventure installment it's great for the captain to get something to do and for the senior staff to also be placed in a seemingly impossible position. Commander Calvin "Hutch" Hutchinson provides a memorable, if short-lived guest role as well as providing Data with an excellent opportunity to explore "small talk". Picard gets a good run at the end of the season with Lessons next up and the captain getting the girl - and Beverly a few uncomfortable conversations along the way. It could well have descended into major chintz but the story remains sensible with a real threat to the romance where you're not too sure if everything will come right in the end. Just to juxtapose the position though against Kirk, it's Commander Daren who chooses to ditch the relationship rather than Picard. Perhaps his second life/death episode with Q earlier in the season had a profound effect on Jean-Luc?! While we're at it, it's amazing what a movie budget can do to your stellar cartography department...! While Lessons gives us a lighter breather, he's back cruising the universe in The Chase looking for clues. Certainly an episode that raises the temperatures of many a Star Trek fan with its explanation of why so many races look the same, The Chase brings Romulans, Klingons and Cardassians together for what was, at the time a rare occasion - by the time we got to the end of Deep Space Nine seven years later such an occurrence was all but common place each week. It's only towards the end of the season that Riker gets some screen time with two outings nearly as the "Picard Trilogy". Frame of Mind and Second Chances are securely focused on the first officer and are far from easy episodes for the XO. He's trapped in the prison of his mind and then upstaged by...himself. Can't be good and how he's not been committed by the end of season six is a hard question to answer. While we're seeing all these returning plotlines and familiar characters season six remains firmly encroached in the arena of good characterisation and interesting stories rather than taking a step onto its soapbox and moralising. One character I do feel sorry for is Beverly. Still to tackle the "interesting" ghost tale that is Sub Rosa she gets her nose put out of joint by Commander Daren, plans to resign during the incident with the metaphysical shielding in Suspicions and then to add insult to injury she's on the business end of a Romulan disruptor in Timescape. We all thought Geordi got a bad deal sometimes. This is one of my favourites of the year and got watched a lot when I was younger. I'm always amazed that this is the single The Next Generation episode to feature a runabout and that the rear section used here was never seen in Deep Space Nine for which it was built on this show's budget. It's classic Braga and must have been a nightmare to film considering the temporally-twisted plot. Who can forget the bizarre moment of Picard drawing a smiley in the smoke of a warp core breach?